I decided to give them ago at my own house and make them BAKED. Healthier and JUST AS delicious! These are a new family favorite! These little appetizers are so delicious. My hubby kept raving about them and that then need to happen weekly haha! We dipped ours into some Sweet and Sour Sauce, but you can dip them into whatever your heart desires. I actually prefer not to dip them in anything. THese look so good--I too loved cream cheese ragoons but try not to eat them because they are fried. Must try the baked versions. Nikki they're so perfect! Like Panda needs to come hire you! So professional looking and I bet taste great! Cream chese ragoons are unbelievable! I have to try these at home. What's not to love?!? Thanks for hosting another great party, Nikki! Have a wonderful week!! I ALWAYS get the cream cheese rangoon at Panda. A baked version sounds great! These little bites look completely irresistible, Nikki! I wouldn't be able to stop eating these! Love this idea! The photos look great. I'm so glad I came across your blog. It looks great! My blog is still really new, and I have a long way to go to get pictures like that! Have you tried adding crab to these --- our Chinese restaurants have meat in them and usually crab-- if so do you keep the recipe the same just add crab? I need to try these!!!! Great idea! 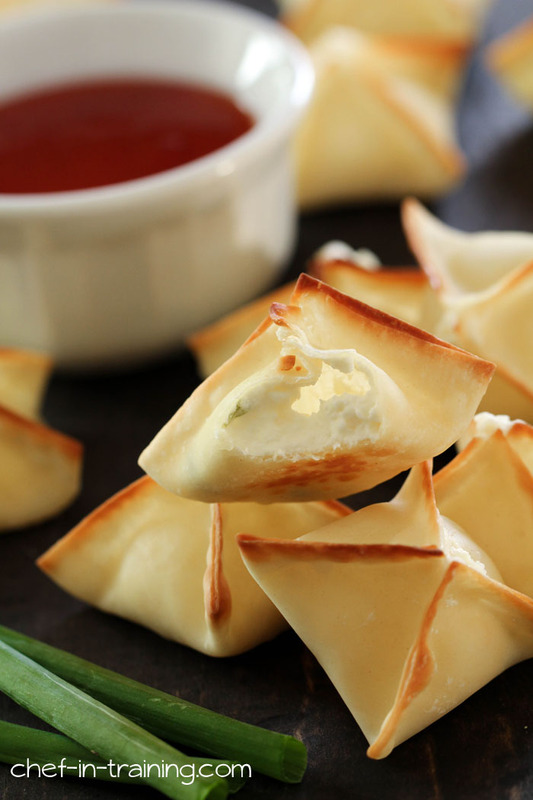 These are actually called cream cheese wontons, not rangoons btw. 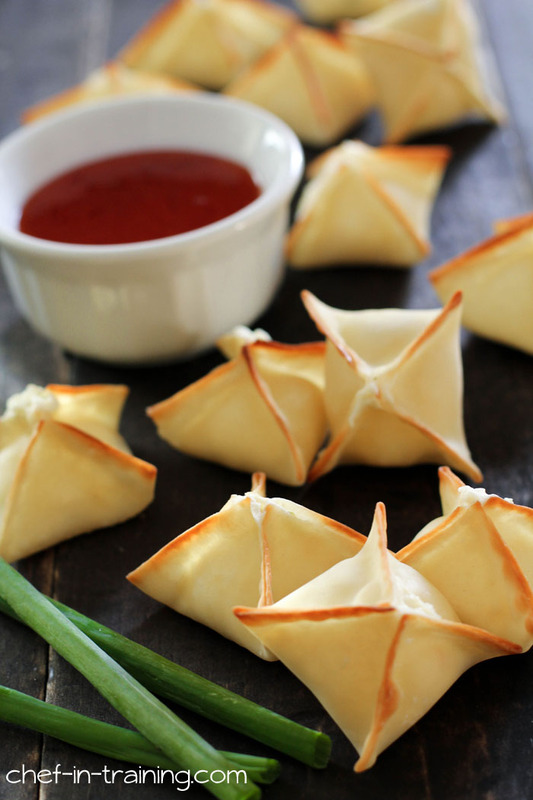 Not sure where you live but around here (southwestern Pennsylvania) whether Chinese, Japanese, or Thai restaurant, they are caled Rangoons when shaped like this or shaped like flowers, but are called wontons when shaped like a triangle or pouch. And it doesn't matter which filling is inside - cheese, cheese & crab, cheese and shrimp. Have not found these in a Korean restaurant. Maybe the name differs by region. What perfect timing! I was just wanting to make some of these for an upcoming party appetizer and wondered if I could bake a bunch at once rather than frying them. Thanks for testing out the theory for me! Next step: forming and freezing them in advance, and baking directly from the frozen state... Let the experiments begin! In St. Louis, we call these Crab Rangoon and are deep fried. I'll make these once I can get out of the snow and get to the store! Thanks for the recipe! can i use something other then crab meat. i have family that cant have sea food. These look delicious!! Where do you find the wonton wrappers? I find the wonton wrappers in the produce section in my grocery store. Usually around the tofu products. They are much better if they were fried like the they do in the Chinese resteraunts because it gives it a crunchier texture. A little cooked and lightly crumbled crab meat can also be folded into the cream cheese mixture before filling the wonton wrappers. The crab adds a nice change of flavor! Substitute 1 T powdered sugar , 1/2 tsp cinnamon , 1/4 tsp nutmeg. Top the 1 tsp of mixture on the wonton with a few pieces of chopped fruit - such as apple or peach - or a couple small berries - such as blue berry. Or use 1 T honey and 1/2 tsp crystallized ginger and some orange zest- tastes great with peaches especially. Please try adding crab to the cream cheese recipe and report back. I guess canned crab? When I was little my mom and dad would take me on Fridays to a Chinese restaurant and we would have crab ragoons. LOVED them. Let me know if you try it with crab meat added. I made these tonight to compliment a simple stir fry meal. They were wonderful. I loved that I could make all the wontons at once and not stand by the deep fryer, cooking only a few at a time. Loved the crunch without the oil. These are going in my recipe collection. FINALLY, a picture that does not show Rangoon that was actually deep fried instead of baked. THANK YOU! I would imagine one could chop up some crab to make them crab rangoon...... Or maybe that small can of clam. Thank You I'm going to make some tonight! Would like to have the dipping sauce recipe to go with this. Hello~ I would love to try the recipe but what can I replace with eggs? I'm allergic to egg. And may I know what is the cooking spray for? Thank you so much! The cooking spray (I buy the ones that are all oil) adds a light layer of oil, which is what makes them crisp up in the oven. Also, you should be able to get them to seal with just water, which is how I learned to make wontons and eggrolls. Hope that helps with your allergies. I have been looking for wonton wrappers...where are they usually located in the grocery store? Whoda thunk? So easy, I like a little bit of Beau Monde seasoning in mine, never baked them though. Looks terrific, will be making tonight. What type of flour do you use in the Orange Dreamsicle Bread? It looks delicious. But I did not know whether to use all purpose or self rising. These were a huge disappointment and fairly expensive to make with the crab. Easy and fun to make and beautiful to look at but they did not brown well and were tough and chewy. Some things just require frying and this is one of those things. Recipe for the sauce?? Plz! 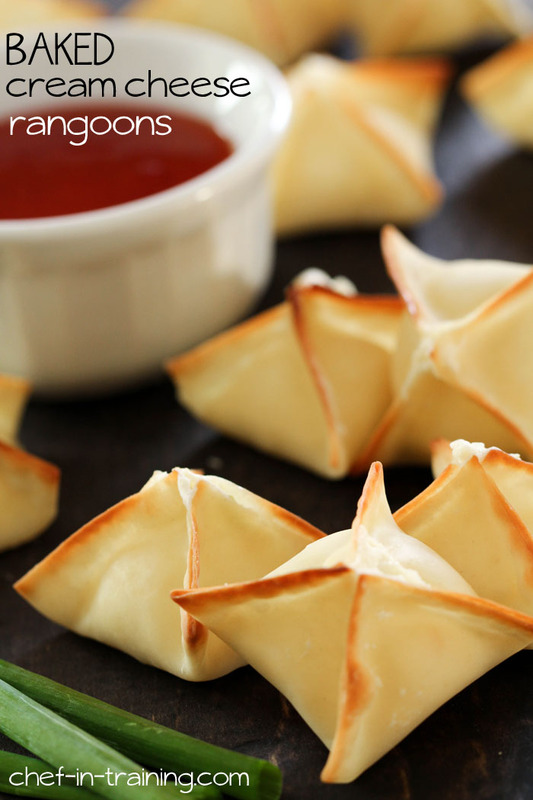 This recipe is actually BETTER than the Cream Cheese Rangoons at Panda Express! I was a manager at Panda and our recipe only contained cream cheese, wontons, and chopped green onions. Won ton wrappers are very close in texture to pasta so you could experiment with making a home made pasta and rolling it out. Deep fried would also work as that is how they are made in restaurants. I have not tried this, but since no one answered you, I figured I would point you in the right direction. Excellent! These are soooo good! I added a bit of imitation crab meat as well and wow... I spent all day at work looking forward to coming home just to eat more!! I'm going to make them again and try the onion and chive flavored cream cheese. Making these right now thank you for this I love them so much. I made them last night and they were just OK. The very tops were crunchy but the part that holds the cream cheese mixture was soft, not like the ones at the restaurant so that was disappointing. These look so good! What kind of dipping sauce would you normally serve with these? Sweet and sour? I will have to try your version of the cream cheese insides. I made another that had crab in it for my daughter's birthday, and she was completely disappointed in them. Your crab-less version is probably a lot closer to the ones at the local Chinese take out.